The Isle of Wight's stunning scenery and wildlife are a big draw for visitors, and underpin the tourist industry. Equally they enhance our quality and enjoyment of life. The Isle of Wight provides a very special sense of place and environmental quality � this is reflected by half of the Island being recognised as an Area of Outstanding Natural Beauty. Our stunning scenery and wildlife are a big draw for visitors, and underpin the tourist industry. Equally they enhance our quality and enjoyment of life. 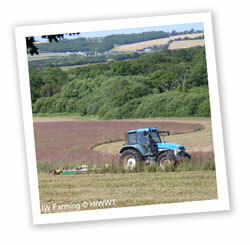 Although only directly employing around one per cent of the Island�s population the farming sector produces food, provides land management, and is involved in environmental stewardship initiatives, all contributing to the local distinctiveness and strong identity of the Isle of Wight. Sensitive land management and the continuation of natural processes (such as coastal erosion), every year draw millions of visitors to our shores, to share this special Island with us. This in turn provides jobs and income for the tourism and allied sectors, our largest employers and creators of wealth. For those of us in other industries and professions, the Island’s landscape, natural and historic environments, provide the backdrop to our lives and can often be the reason for corporate relocation to rural areas, to gain a better quality of life for their employees. The Farmers’ Market, held in St Thomas’s Square, Newport each Friday and in Ryde Square every Saturday, started in 2002 and is now regularly supported by over 20 traders selling local produce and products. These markets help to bridge the gap between people and the environment, reduce food miles, and provide an income to those that are actively managing our beautiful and bio-diverse Island. Gift to Nature, managed by Island 2000 Trust, utilises collection boxes or envelopes held by various tourism providers or other fund raising resources, for visitors (and residents) to make voluntary donations. The money raised is then used to fund local conservation projects. The Green Island Awards highlight businesses that have demonstrated a commitment to improving and promoting environmental best practice through energy saving, water reduction, local produce and services, landscape and wildlife and sustainable forms of transport. “Finest Landscapes” visitor information packs, produced by the Isle of Wight AONB partnership are available to visitors in the rooms of many of the Island’s holiday establishments. They highlight some of the many features that make the Island so distinctive.